Phoenix Family Foodie Blog: OH CAP'N MY CAP'N! In an article published on Wednesday, Ryan MacClanathan, business producer at msnbc.com, reports that "The Soggies have finally won: Cap'n Crunch is quietly sailing into retirement." "Long derided by health experts for its high sugar content – a single serving contains 12 grams – the cereal is no longer being actively marketed by Quaker, DailyFinance reports. It appears parent company PepsiCo is forcing the good Cap'n to walk the plank." "Cap'n Crunch was once the No. 1 breakfast cereal, but pressure from the White House and health activists is having an effect on how PepsiCo and other food companies peddle their products to kids. Sales of the cereal were down 6.8 percent in 2010." "Last year, PepsiCo vowed to reduce added sugar per serving by 25 percent and saturated fat by 15 percent in its products over the next 10 years." "PepsiCo is no longer marketing Cap'n Crunch cereal directly to children. In a sense, you could say that they have retired Cap'n Crunch, and that's a good thing," Jennifer Harris, of the Rudd Center for Food Policy & Obesity at Yale University, told DailyFinance. "Unfortunately, children continue to view hundreds of ads per year for high-sugar cereals from General Mills, Kellogg's and Post Foods." The critics have a point: Children cereals contain 85 percent more sugar, 65 percent less fiber and 60 percent more sodium when compared with adult cereals, according to the Rudd Center research. The average preschooler has viewed more than 500 television ads for such cereals." Now, I don't encourage people to eat cereal like this on a daily basis, but I do believe that treats in moderation make for a happy and healthy being. When my baby gets a little older I plan on teaching him that we eat very healthy during the week, and for one meal a day during the weekend, he can eat whatever he wants. That's most likely going to be two "sugar bombs" per week. I think we can all live with that. So, in light of the Captain's ship slowly sinking into the briny blue, I'm paying tribute today by sharing my Cap'n Crunch French Toast with Peanut Butter Maple Syrup. My mom and I developed this recipe after having a somewhat tame version, at a brunch restaurant here in San Diego. 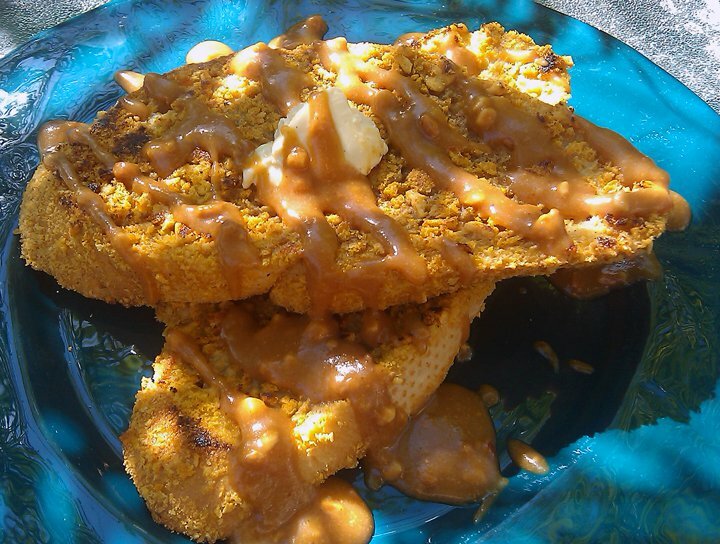 The chef just lightly dusted the edges with Cap'n Crunch crumbles, but we came home, covered every inch of our bread in crunchy goodness and then took it over the top by mixing some delicious natural peanut butter into our maple syrup. It's an easy and very decadent, tasty recipe! Put the cereal in a large plastic storage bag and seal. Smash the bag with a mallet or your fist to completely crush all the cereal. Combine eggs, brown sugar, cinnamon, cream cheese and vanilla in an immersion blender or food processor and mix until smooth. Transfer the egg batter and cereal into two separate, flat baking dishes. Dip one piece of bread in the batter and then coat all sides and edges in the cereal. Cook the bread on a heated skillet at 375 degrees for 3-5 minutes per side. Repeat with the other pieces of bread. Combine the peanut butter and maple syrup. Whisk vigorously until combined and smooth. Pour over the french toast and ENJOY!